Thanks for Ordering "Explode Your Practice Through Web Marketing!" Kudos to you! You've taken the first step towards better marketing your law firm, and we commend you for that! 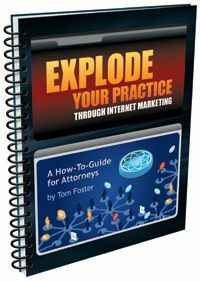 You can download Explode Your Practice Through Internet Marketing here. We want you to see that the Foster Web Marketing way works—if you work it. If you are successful because of what we've shared, there is no better compliment we can receive. And finally, because we really do care about our clients, and we want you to do well! They say one smart decision leads to another...here's your next smart decision! When it comes to marketing, you can’t just “set it and forget it”. Search engines are ALWAYS making changes and updates, and if you don’t stay on top of these changes, you website—and business—is going to suffer. Our goal is to find this sort of information first, and then share it with you. We are all about education, and we’re happy to share these insider secrets with you—we want to earn your trust! Make sure you’ve got a leg up on your competition by signing up for our monthly newsletter. Fill out the form below, and we’ll send you the most current marketing news and information that successful businesses need to stay on top. Want proof that our newsletters rock? You can see our archive of print newsletters here.